I studied for and received ACSM Personal Trainer Certification in one month - and here's how you can, too. Even though the American College of Sports Medicine recommends that you study for about three months to pass their exam. 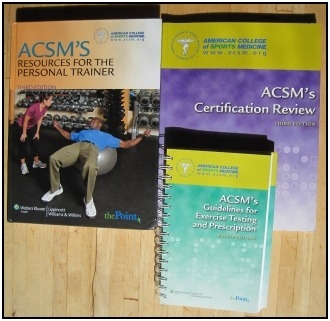 This guide walks you through the steps needed to study for and pass the ACSM Personal Trainer exam. It's as simple as that. But if you want to do it there's a lot of studying to do. So, read through the guide to get the broad picture of what you'll have to do and then plunge in. Time's a wasting! Go to the ACSM certification website and look at their certification info. This will tell you what's involved in becoming a personal trainer, and what you should expect from the course. Still want to become a personal trainer? Good; on to Step 2! Getting CPR certification is pretty straightforward. Just go to theAmerican Heart Association website to find a course or the American Red Cross's Take a Class page to find a certification program. If you're pressed for time check out the American Heart Association, since some of their CPR certification classes are 4 hours long. The Red Cross classes are 8 hours long. Sign up for a CPR class and take it (~ $80 - $100). And while you're waiting to take the class you just signed up for, go on to Step 3. Go to ThePoint.LWW.com and order the Personal Trainer Study Kit, which contains the 3 books you'll need to familiarize yourself with for ACSM Personal Trainer certification. This is about 480 pages of reading, and very dry. Don't read it trying to remember everything; rather, read it with an eye toward getting used to the Latin vocabulary for different parts of the body, exercise terminology, and nutrition information. Remember that on the inside cover there's a little silver scratch rectangle with a code to access an online copy of the textbook. This is handy if you're traveling a lot while studying, or to search the text to locate a word, phrase, or topic quickly. This is only 180 pages of reading, and should be significantly easier after reading the textbook. Again, read with an eye toward comprehension rather than trying to memorize everything. Ideas and subjects will be repeated, which will naturally give you a better grasp of the topics. This book also has a little silver scratch rectangle with a code to access an online copy of the handbook on the inside of the front cover. Use it. Read through the study guide, this time with an eye toward remembering it. 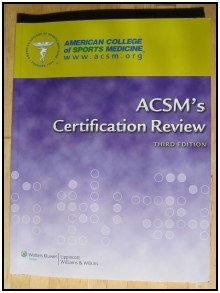 You can skip Chapter 12, on Electrocardiography, because it isn't on the ACSM personal trainer certification exam. At this point, you should be thoroughly familiar with the material you're reading and going over for the THIRD time. It shouldn't take a lot of effort to familiarize yourself with the info, and remember the big ideas. One Important Note: DON'T do the mini-test chapter reviews at the end of each chapter yet. We're gonna save those for later. The ACSM may be the gold standard for personal training, but their review materials could sure use a good editor. I called them to talk about this, and they told me that they do all their editing in-house and that misspellings sometimes creep in. I believe they should be embarrassed by the sheer volume of grammar and spelling errors (at least 1-3 per chapter). Perhaps they'll get better in future, but don't hold your breath. 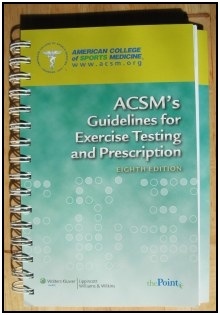 You used to be able to check out a list of the errors in the ACSM textbooks. However, it appears that they've taken down that page - even though it was never a complete catalogue of all the errors in their books. My advice? When you come across something that doesn't make sense, check in other material to see if it makes sense. This is true of the exercise problems as well - some of the listed answers are incorrect. Just go through the problem again to check yourself, slowly, and you'll be able to figure out whether it was your error or the book's. If you can, do some (or all) of the official ACSM online learning courses. It's helpful to study the same material in a different medium, and you get exposed to a slightly different cross-section of the material online than is in the book. Most courses are around $30. The process I used to study for the exam, which took a few days, is fairly detailed. Check out this exam study guide. Step 7 - Webinars and Seminars? The ACSM advertises webinars and in-person workshops/seminars to prepare for their tests. These are probably nice, especially if you're a hands-on learner, but really aren't necessary. There weren't any seminars scheduled for my geographic region for the next 3-5 months when I looked, and I didn't feel like taking a webinar. So I decided not to take them. And, since your ACSM Personal Trainer certification exam is a multiple choice test rather than a hands-on in-person exam, I don't think they're necessary. You should have figured out just about everything you need to know, and have a pretty good grasp on it by this point. But, if you still have questions about the exam, exam material, or anything else… ASK THEM! They have agents available Monday – Friday, 8:30 a.m. – 4:30 p.m. Eastern Time. Get any final issues/questions about ACSM Personal Trainer certification that you have answered. 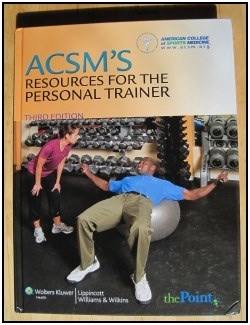 Go to PearsonVUE and register for your ACSM Personal Trainer certification exam. If you look at the nearest 10 testing centers to your US zip code you can probably find a test in the next few days. I was able to find one the day after I decided to register, which worked out great. Wake up early, eat a good breakfast, and get to the testing center early. And you don't even need to bring a #2 pencil, since the ACSM Personal Trainer certification exam is on a computer. You'll have 2.5 hours to answer 150 questions, but it probably won't take that long, especially if you've spent many school years taking standardized tests. Going slowly and methodically, I finished the exam in about an hour and a half. You'll get to flag questions that you want to review at the end of the test, and skip questions and come back to them later (if you have time). As soon as you click the final submit button on your exam, you'll find out if you passed. Step 11 - Party Down! You're now a ACSM Certified Personal Trainer!!!! • Click here to learn more about How to Become a Personal Fitness Trainer! • Click here to leave 'Getting ACSM Personal Trainer Certification in 1 Month' & go back to the Home-page!